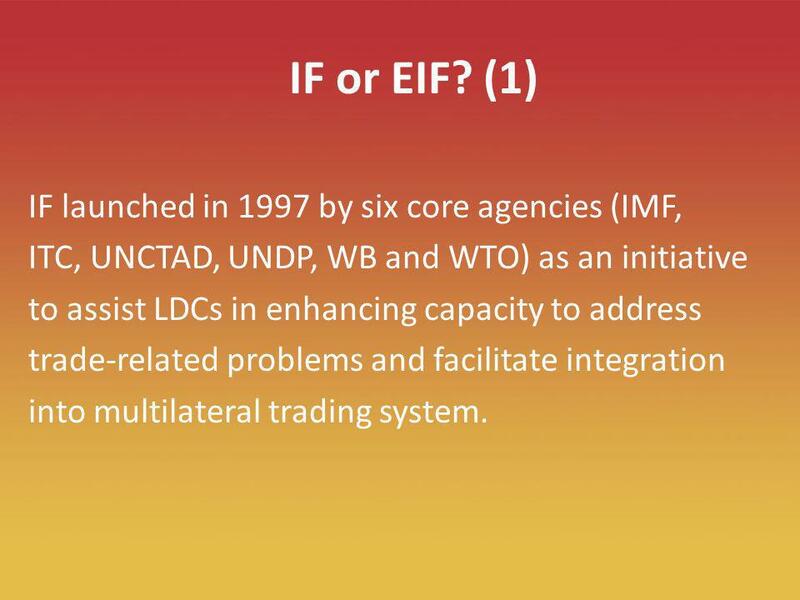 3 3 EIF is Aid for Trade The Enhanced Integrated Framework is Aid for Trade in action for the LDCs. 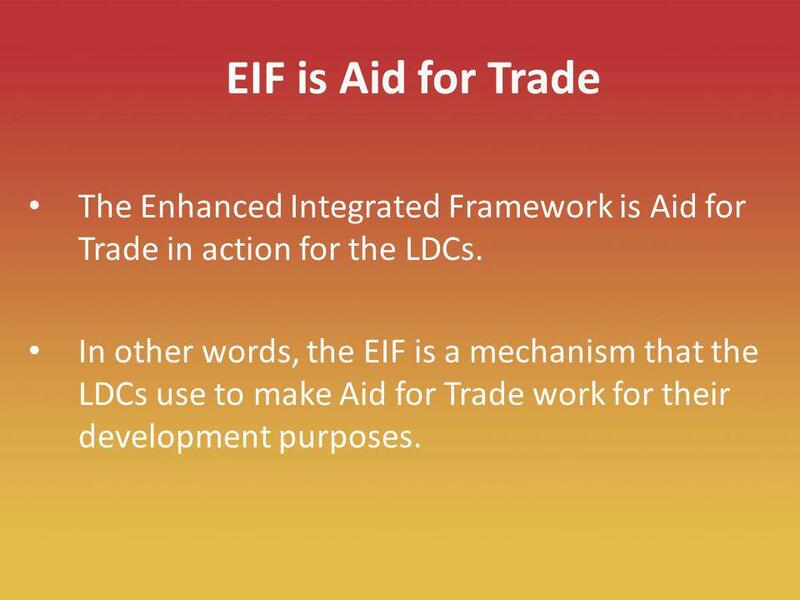 In other words, the EIF is a mechanism that the LDCs use to make Aid for Trade work for their development purposes. 4 4 IF or EIF? (1) IF launched in 1997 by six core agencies (IMF, ITC, UNCTAD, UNDP, WB and WTO) as an initiative to assist LDCs in enhancing capacity to address trade-related problems and facilitate integration into multilateral trading system. 5 5 IF or EIF? (2) Following Members decision in 2005 for a Task Force to review the IF and come up with recommendations on possible improvement, the programme has been restructured to increase resources, strengthen in- country capacities and enhance global structures. 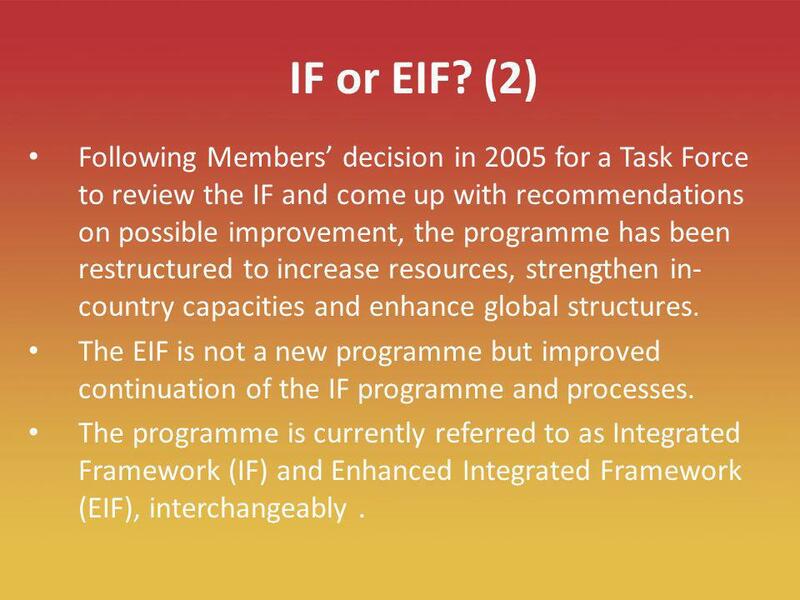 The EIF is not a new programme but improved continuation of the IF programme and processes. The programme is currently referred to as Integrated Framework (IF) and Enhanced Integrated Framework (EIF), interchangeably. 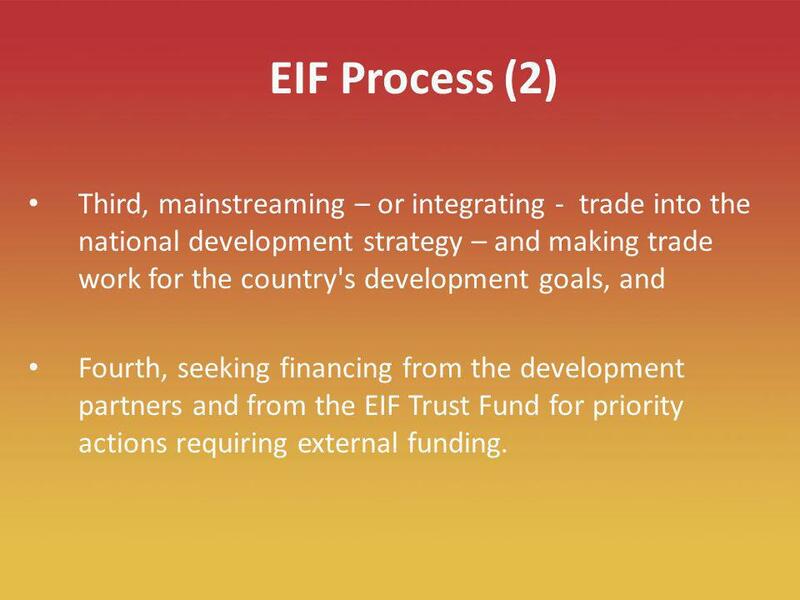 8 8 EIF Process (2) Third, mainstreaming – or integrating - trade into the national development strategy – and making trade work for the country's development goals, and Fourth, seeking financing from the development partners and from the EIF Trust Fund for priority actions requiring external funding. 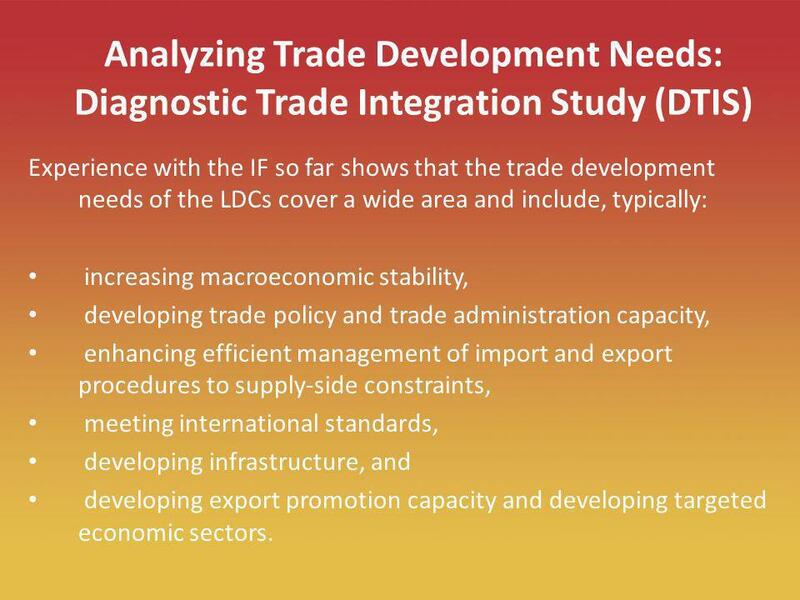 9 9 Analyzing Trade Development Needs: Diagnostic Trade Integration Study (DTIS) Experience with the IF so far shows that the trade development needs of the LDCs cover a wide area and include, typically: increasing macroeconomic stability, developing trade policy and trade administration capacity, enhancing efficient management of import and export procedures to supply-side constraints, meeting international standards, developing infrastructure, and developing export promotion capacity and developing targeted economic sectors. 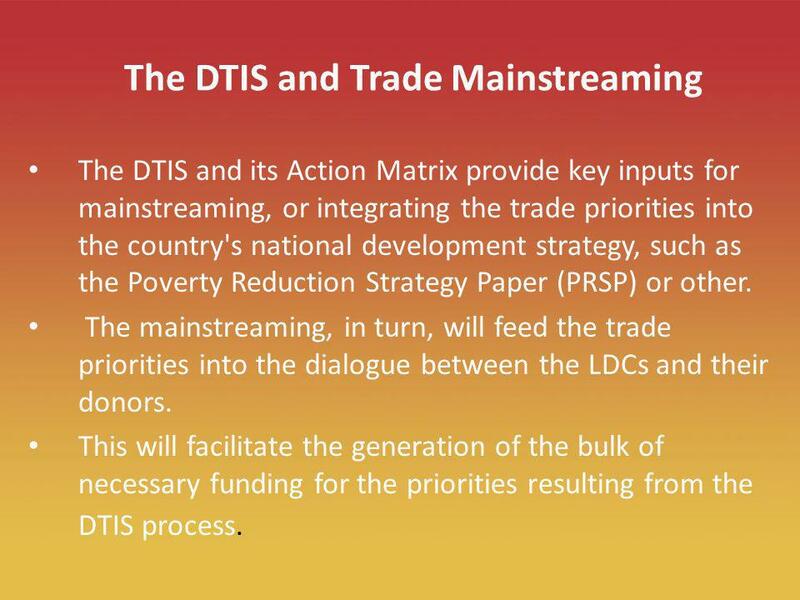 10 10 The DTIS and Trade Mainstreaming The DTIS and its Action Matrix provide key inputs for mainstreaming, or integrating the trade priorities into the country's national development strategy, such as the Poverty Reduction Strategy Paper (PRSP) or other. The mainstreaming, in turn, will feed the trade priorities into the dialogue between the LDCs and their donors. This will facilitate the generation of the bulk of necessary funding for the priorities resulting from the DTIS process. 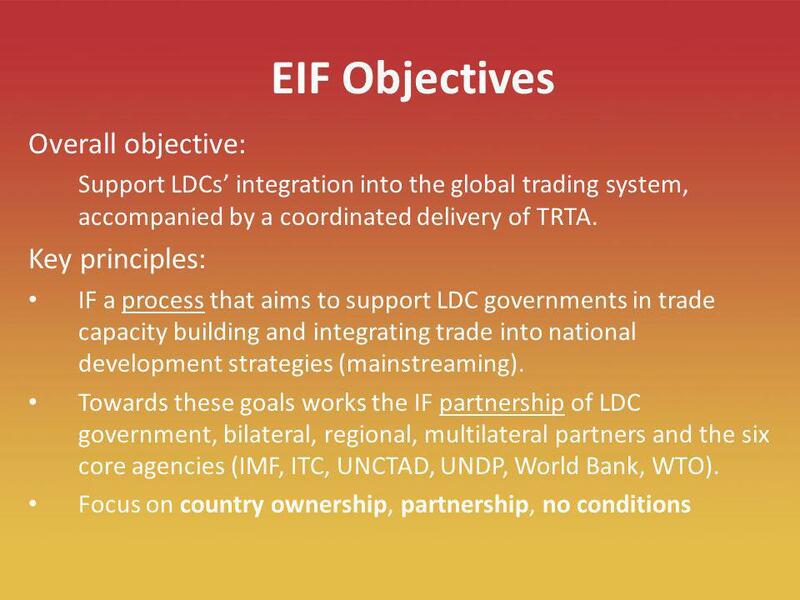 12 12 Integrated Framework Overall objective: support LDCs to further and better integrate into the global trading system. 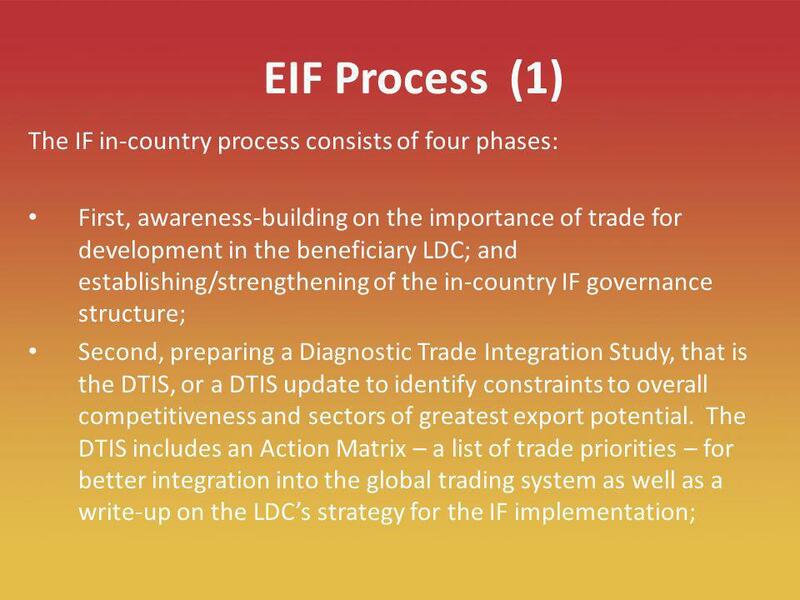 Key principles: The IF is a process that aims to support LDC governments in trade capacity building and integrating trade issues into overall national development strategies (mainstreaming). Towards these goals works the IF partnership comprising LDC governments, bilateral and regional development partners and six core agencies (IMF, ITC, UNCTAD,UNDP, World Bank, WTO). 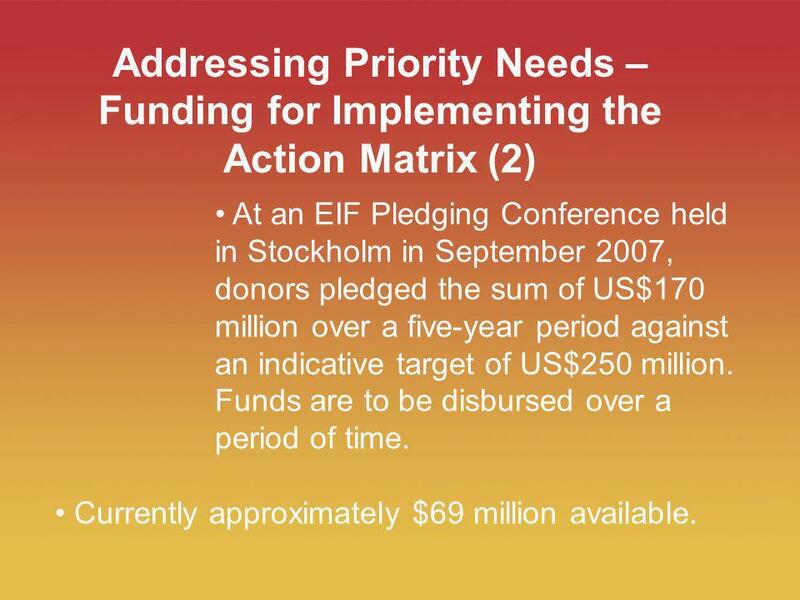 Focus on country ownership, partnership, no conditions 12 Addressing Priority Needs – Funding for Implementing the Action Matrix (2) At an EIF Pledging Conference held in Stockholm in September 2007, donors pledged the sum of US$170 million over a five-year period against an indicative target of US$250 million. Funds are to be disbursed over a period of time. Currently approximately $69 million available. 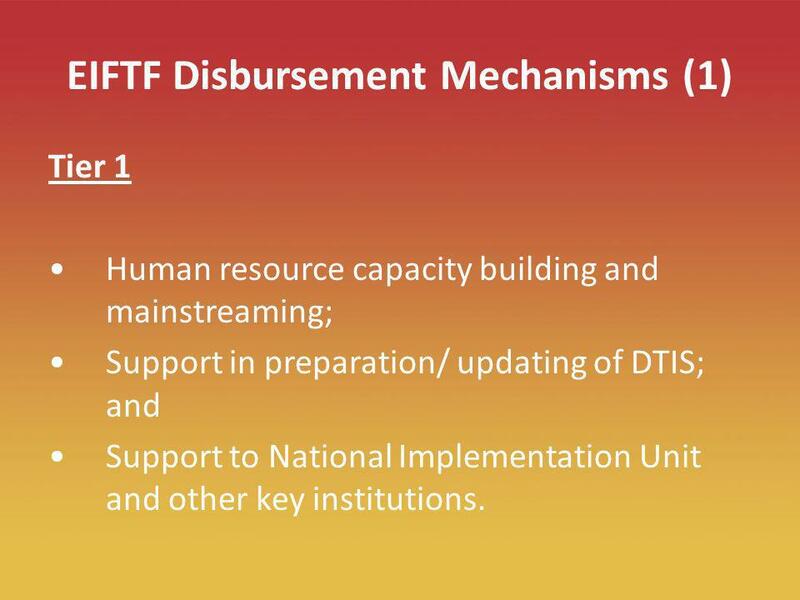 13 13 EIFTF Disbursement Mechanisms (1) Tier 1 Human resource capacity building and mainstreaming; Support in preparation/ updating of DTIS; and Support to National Implementation Unit and other key institutions. 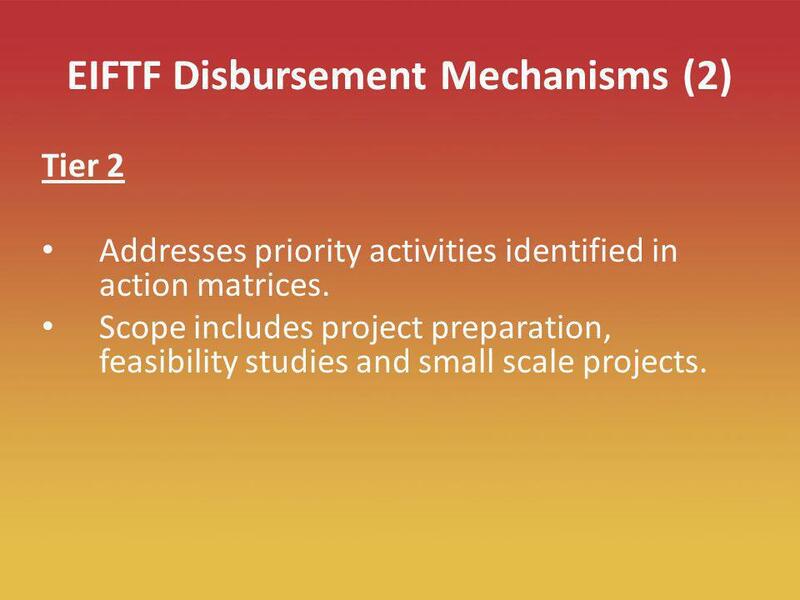 14 14 EIFTF Disbursement Mechanisms (2) Tier 2 Addresses priority activities identified in action matrices. Scope includes project preparation, feasibility studies and small scale projects. 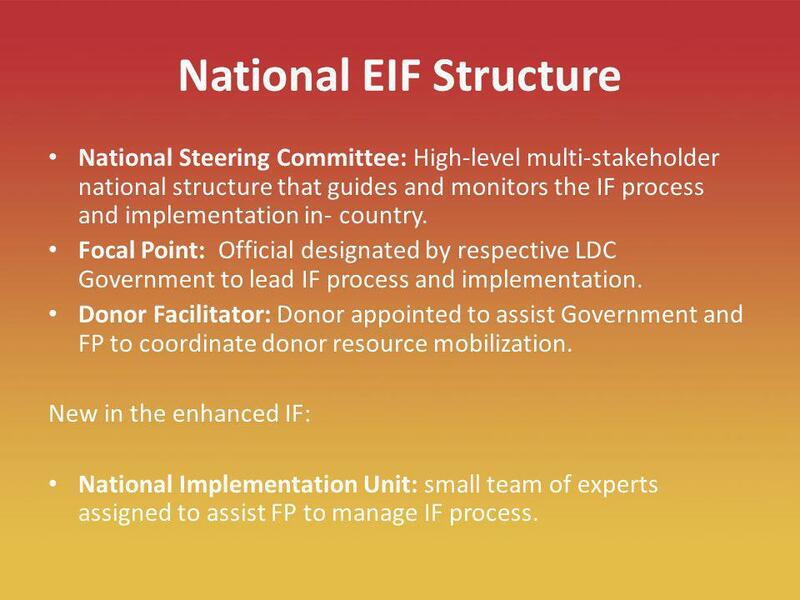 15 15 National EIF Structure National Steering Committee: High-level multi-stakeholder national structure that guides and monitors the IF process and implementation in- country. Focal Point: Official designated by respective LDC Government to lead IF process and implementation. Donor Facilitator: Donor appointed to assist Government and FP to coordinate donor resource mobilization. New in the enhanced IF: National Implementation Unit: small team of experts assigned to assist FP to manage IF process. 16 16 Enhancement of in-country structures To assist in the enhancement of management of the IF process in country, the EIF has provided resources to establish and finance an NIU to support the Focal Point. 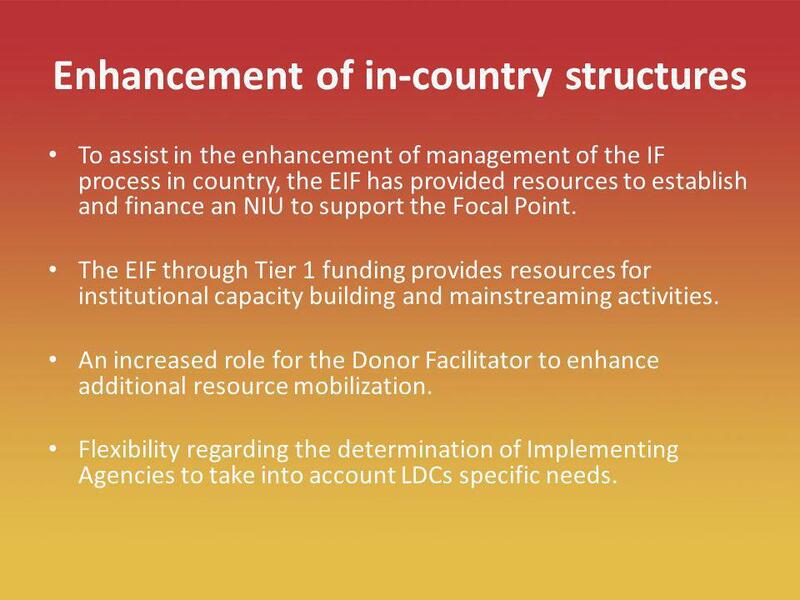 The EIF through Tier 1 funding provides resources for institutional capacity building and mainstreaming activities. An increased role for the Donor Facilitator to enhance additional resource mobilization. Flexibility regarding the determination of Implementing Agencies to take into account LDCs specific needs. 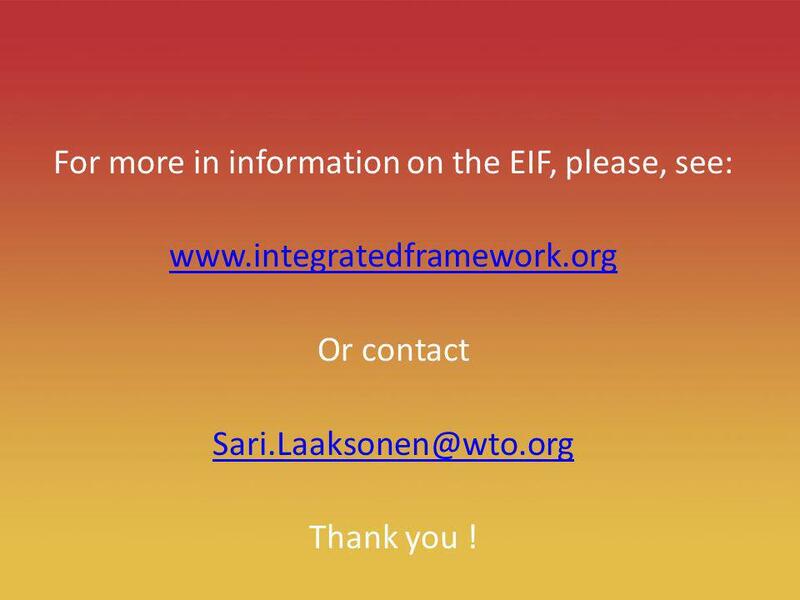 17 17 Enhancement of global structures The EIF is governed by a Board constituted by three LDCs, three Donors and the Core Agencies (presently IMF, ITC, UNCTAD, UNDP, WB and WTO). Establishment of an Executive Secretariat to provide technical assistance to LDCs on a daily basis. In place since October 2008. 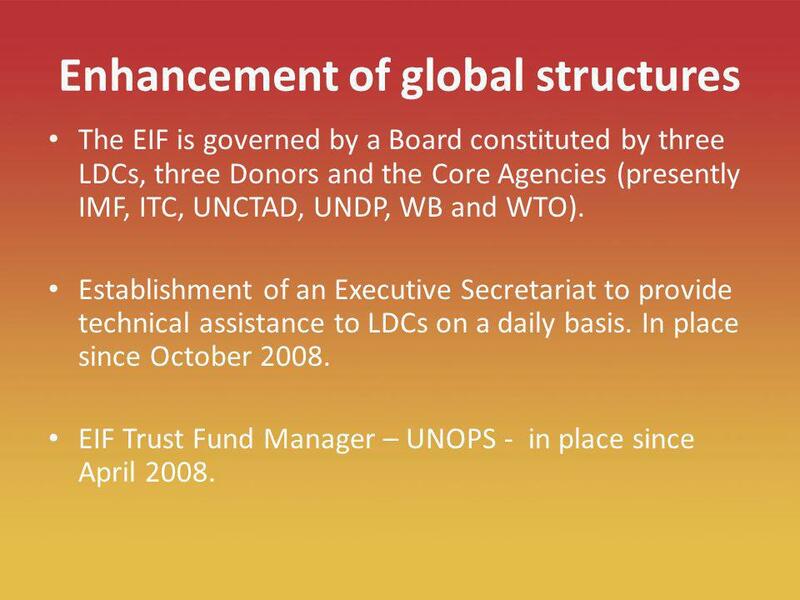 EIF Trust Fund Manager – UNOPS - in place since April 2008. 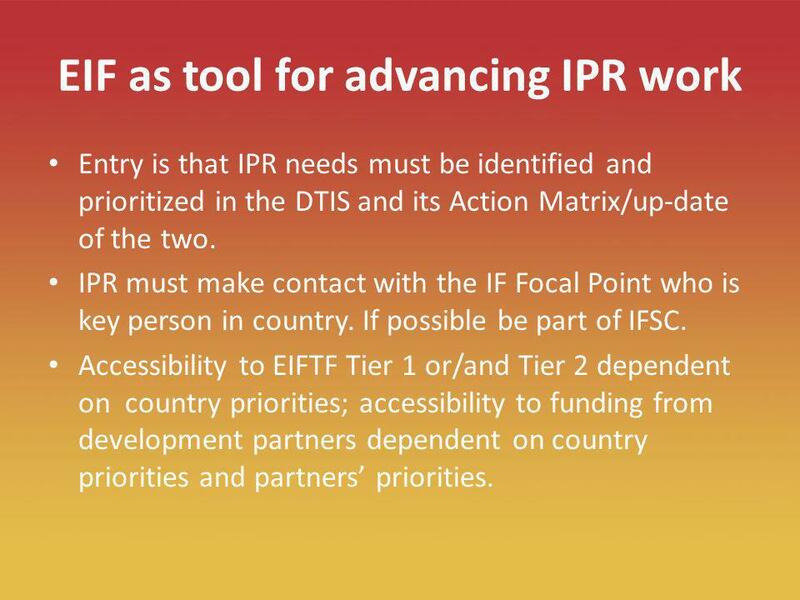 18 18 EIF as tool for advancing IPR work Entry is that IPR needs must be identified and prioritized in the DTIS and its Action Matrix/up-date of the two. IPR must make contact with the IF Focal Point who is key person in country. If possible be part of IFSC. 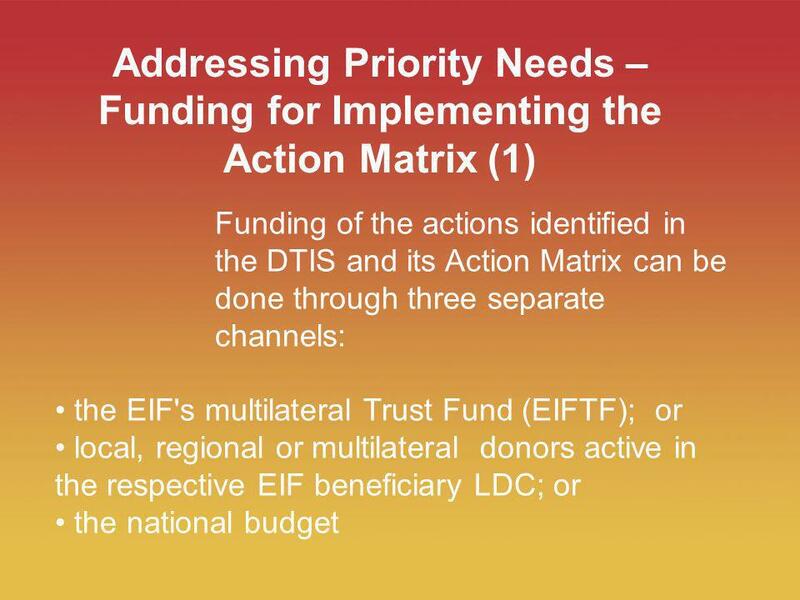 Accessibility to EIFTF Tier 1 or/and Tier 2 dependent on country priorities; accessibility to funding from development partners dependent on country priorities and partners priorities. 19 19 Example of assistance that can be provided Studies, e.g. 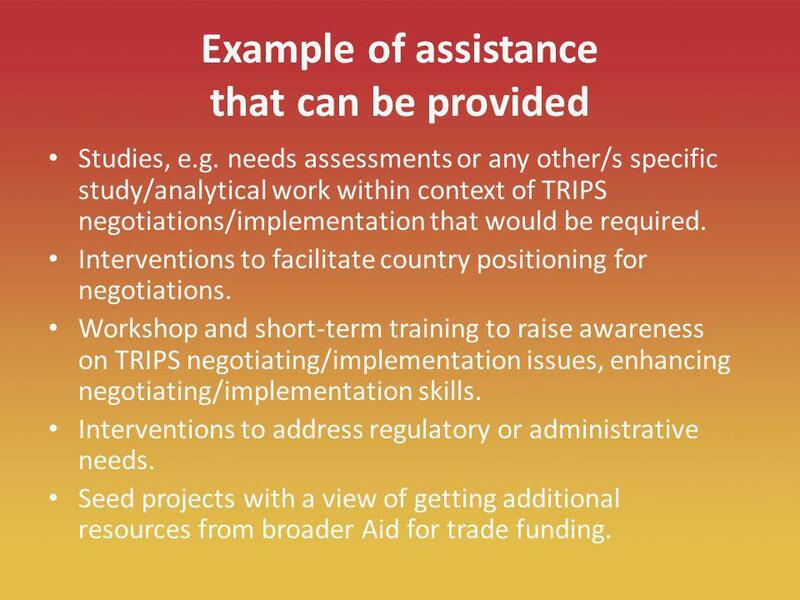 needs assessments or any other/s specific study/analytical work within context of TRIPS negotiations/implementation that would be required. Interventions to facilitate country positioning for negotiations. Workshop and short-term training to raise awareness on TRIPS negotiating/implementation issues, enhancing negotiating/implementation skills. Interventions to address regulatory or administrative needs. Seed projects with a view of getting additional resources from broader Aid for trade funding. 20 20 For more in information on the EIF, please, see: www.integratedframework.org Or contact Sari.Laaksonen@wto.org Thank you ! 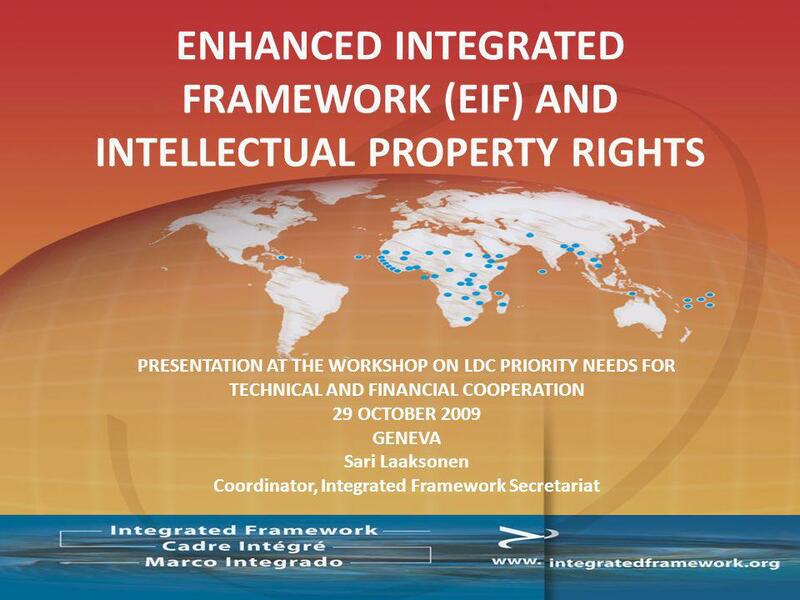 Download ppt "PRESENTATION AT THE WORKSHOP ON LDC PRIORITY NEEDS FOR TECHNICAL AND FINANCIAL COOPERATION 29 OCTOBER 2009 GENEVA Sari Laaksonen Coordinator, Integrated." Process and mechanics of HFA progress monitoring and Review Sujit Mohanty, UNISDR The Hyogo Framework for Action Progress Review and Reporting. 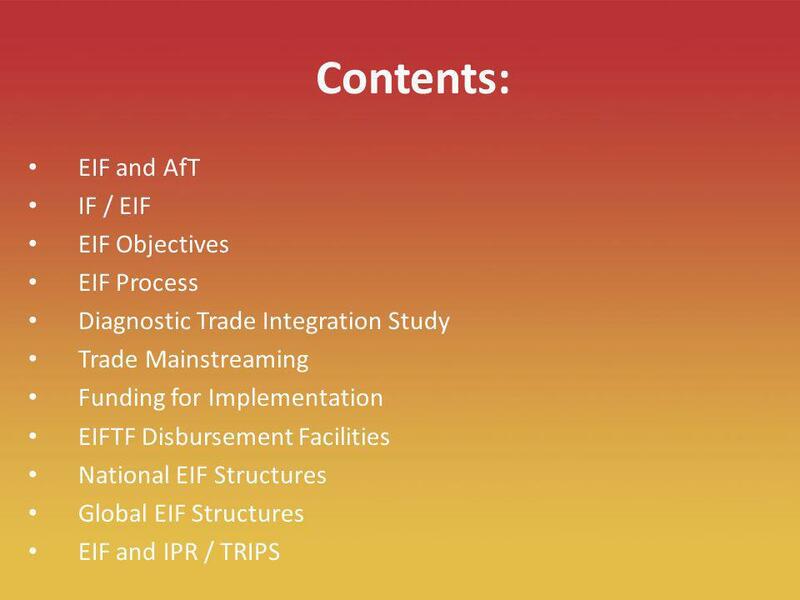 Enhanced Integrated Framework for Trade-Related Technical Assistance to Least Developed Countries (EIF) IF Programme Implementation Unit (PIU) World Trade. Establishing a National Working Group on Trade Facilitation Challenges and Lessons Learned Presented by Elizabeth Tamale Ministry of Tourism, Trade and. WTO Symposium, GENEVA,08 November, 2011 Study of Trade Facilitation Initiatives in Pakistan Implementing trade facilitation reforms: Aligning national. UNCTAD Technical Assistance and Capacity Building in Trade Facilitation WTO, NGTF, 1 July 2009.